When it comes to Hollywood, the words 'Based on a true story' mean little in terms of historic accuracy. Liberties are always taken with real life events - sometimes this benefits the final product, sometimes it doesn't. 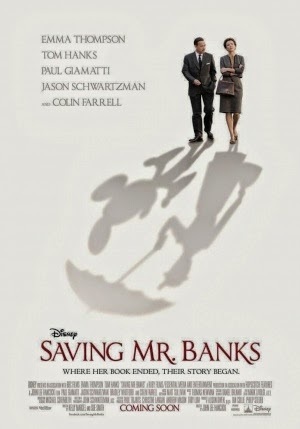 In the case of Saving Mr. Banks, a story of Walt Disney trying to gain the rights to the Mary Poppins novels by P.L Travers, the dramatization breathes a welcomed positivity to what was truly a very grim part of Disney history. The story concerns filmmaker Walt Disney (Tom Hanks) as he seeks to turn the renowned Marry Poppins stories into a magical feature film; an aspiration not shared by the author P.L. Travers (Emma Thompson), who fears Disney will transform her cherished creation into a silly cartoon apt for only the youngest of audiences. Tensions rise as Travers continues to dislike the ideas the Disney studio has for the project, which in turn begins to uncover her troubled past and the truth behind her books - and their deeper meanings within. Though evidently leaning towards a more positive outlook on the real story, Saving Mr. Banks nevertheless surprises with a script full of complexity and a warm heart. Tom Hanks effortlessly plays the legendary man himself with tons of finnesse and charm - sometimes he seems even more like Disney than Disney himself. Our main character, however, is Mrs. Travers - a complex dame who's rendered to be unlikeable and often irritating, but her backstory evens this out to allow us to sympathize and understand her flaws. She grates on the ear drums a bit, but Thompson still crafts a memorable character with her funny and emotional performance. The script contains enough innocence for children to be entertained, but is just as engaging for adult audiences - complex themes of troubled childhoods, broken homes and even alcoholism flow throughout the narrative as we explore the saddening past of Travers. Her chemistry with Hanks' Disney is perhaps not as refined as it could've been, and I wish he had more appearances than initially suggested, but he still brings a lot of the central humour and appeal to the film and Hanks delivers one of his most endearing performances to date. Him and Thompson are also supported nicely by an excellent supporting cast, featuring Colin Farrell, Paul Giamatti and Bradley Whitford. Saving Mr. Banks is a heartwarming film with a solid balance of humour and emotion. Yes, it takes many liberties to make the original tale a bit more cheery, but the end result is still an interesting and highly entertaining product that any Disney fan should easily enjoy. It's not gonna be in cinemas for much longer, so I suggest you check it out ASAP if you haven't already!